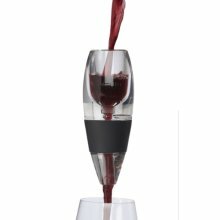 That’s what the Vinturi Red Wine Aerator promises. I could prattle on incessantly using pompous words describing the delicate and subtle nuances of shoe leather and armadillo spleen I was able to detect when using this device, but I won’t. …but Bernoulli like chardonnay…and besides, the concept is simple…It let’s the wine “breathe” by artificially injecting “air” into the wine as you pour it through a venturi sleeve from the bottle into a glass or decanter. It makes a cool gugrling sound while it does its magic, too. What I will tell you is that I very much could detect differences in bouquet, flavor and finish when I used the device versus when I didn’t. I did back-to-back, blind taste tests including testing wine straight out of the bottle (literally,) poured into a glass and swirled and then using the vinturi. It works. I enjoy my wines more when I use the device. It opens up the wine, it’s smoother and makes cheap and expensive wine taste better. I don’t know what else to say. I bought mine in Brookstone. About $25 online. Go on and git yourself one, ya’hear?